FINALLY! MAC just released the info on the friends and family sale from June 16th to 18th, online ONLY. 25% off all products on maccosmetics.com. 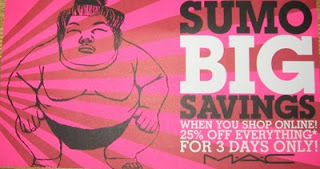 Discount code is SUMO. I do not suggest waiting long on this as limited edition items and brushes sell out first. I will be picking up Naked Honey with the Discount, trace gold blush, as well as some brushes and eyeshadows in Pan form. I will list it all out later for you lovely ladies. Also, As a bonus, Bobbi Brown is also having a friends and family sale online. Code is SUMMER1 at check out for 25% off. June 8th to the 11th. I just hauled Style Warriors and got some other stuff so don't need anymore MAC right now and luckily I have a Pro card so can take advantage of 35% off (40% though whenever I use it stateside for some reason, not that I'm complaining!!) whenever. I dunno what to get though. Don't want any of the new BB bronzers, maybe cheek tints and creme blushes? BB bronzers? What is that? I am thinking about to get the bobbi brown runway kit. Sweetie - nope, not valid for us UK shoppers. If only!!! I had just posted something on my site about the MAC sale rumour - so thanks for confirming! i've directed my followers here to see your post. Thanks!! I feel some major hauling will be happening for me -- Naked Honey, a brush or two, and maybe a few eyeshadows staples for the palette. Love M.A.C & Love BB. I'll def purchase some from both companies. Thanks for posting. Hooray, can't wait. Female- Yes Naked honey will be out by then, and you should be able to get the 187! I'm going to be hauling on some more Style Warriors, two things from Naked Honey and some brushes before they go out of stock. Fadiva- Great Idea. I am sure the brushes will be the first to go! Hey girl, I am loving your blog. I just got the urban decay baked palette, finally, and I've only used it once but I looove it so much. The blue is so pretty and works really well with the other colors:) I'll be doing swatches and a review on it in a few days! Is it off each individual product, or off the entire order? What blush brush would you recommend from MAC? Thanks in advance belle!